This study examined the influence of motivations for, and reliance, on social network sites on selective exposure (purposely seeking agreeable political information) and selective avoidance (purposely dodging disagreeable political information). The results are based on an online survey that was posted during the four-week period surrounding the 2008 presidential election. The responses from 1,530 politically interested social network users revealed five primary motivations were found for accessing social network sites: (1) political information seeking, (2) anti-traditional media sentiment, (3) expression/affiliation, (4) political guidance/judgments, and (5) personal fulfillment. Of these five motivations, the latter three predict selective exposure but none predict selective avoidance. Reliance is not a predictor of selectivity, but gender and several political characteristics are predictors of both selective exposure and selective avoidance. Social networking is often used to widen social circles and boost online social standing, but more so it has evolved into a powerful tool that links individuals ideologically, politically, culturally, and professionally. Beyond simply connecting individuals to each other, social network sites (SNS) have profoundly changed the way people interact and with whom they interact. Social network users are exposed to people, ideas, and opinions to which they would otherwise not have access. This exposure, in turn, has altered and intensified networkers’ worldviews. Social networks today are marked by network individualism where every individual has his or her own personal community that ranges from close friends and family to people unknown outside of the electronic network. 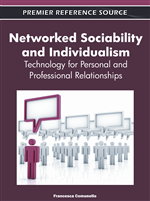 People communicate to their own personal networked community through social media such as blogs, text messaging and SNS as well as through more traditional sources such as telephone and person-to-person communication (Boase & Wellman, 2005; Castells, 2007). While personal networks can supply important elements of community to individuals such as support, sociability, information, social identity and a sense of belonging (Wellman, Boase & Chen, 2002, Wellman et al., 2003), there is also a fear is that SNS are another way for online users to block out opposing views and expose themselves to only agreeable information (Castells, 2005; Wellman, et al., 2003). Ultimately, the consequences of such selectivity are an even more polarized and fragmented electorate (Stroud, 2008, 2010; Sunstein, 2001) and less tolerance for opposing viewpoints (Mutz, 2002). Ordinary citizens are using SNS as a way to sway their network of friends to a particular political point of view or candidate. For instance, 40% of all social network users and 50% of those under the age of 30 used SNS to obtain or share information about politics and the 2008 presidential election campaign. Specifically, 29% of SNS users sought their friends’ political interests or affiliations and 22% looked for information about a candidate or campaign (Smith & Rainie, 2008). Further, about 28 percent of all Internet users get news or political information from friends they follow on Facebook and about 13% of online users have become a fan or friend of a journalist or news organization (Purcell, Rainie, Mitchell, Rosenstiel, & Olmstead, 2010). Barack Obama and his staff recognized the powerful influence of social network sites and thus relied heavily on them to drum up support for his 2008 bid for the presidency. Pundits claim that this use of social networks contributed to Obama’s victory in what is dubbed the “Facebook Effect” (Fraser & Dutta, 2008; Kenski, Hardy, & Jamieson, 2010). Considering the effect SNS use had on the election, and its influence on a politically polarized world and on the way individuals manage their social and political relationships, it is important to understand the reasons for turning to SNS and what information is being sought. Therefore, this chapter focuses on whether reliance on social network sites and motivations for accessing these venues strengthen the propensity for social network users to avoid political information they disagree with or to look for only what they are favorably inclined toward. This chapter relies on the responses of individuals who completed a survey that was posted online during the four weeks surrounding the 2008 presidential election.